Courage Campaign | Tell Blue Cross: discrimination is NOT an acceptable policy. Tell Blue Cross: discrimination is NOT an acceptable policy. 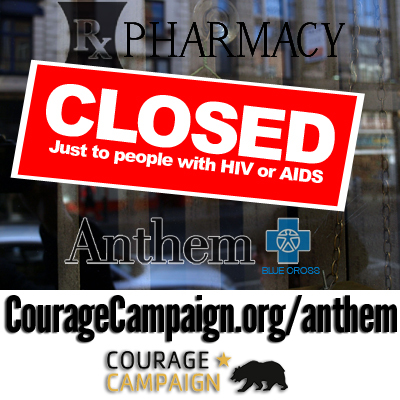 Recently, Blue Cross required HIV/AIDS patients to end relationships with their local pharmacists. Instead, they have to start receiving the drugs that keep them alive from a nameless, faceless mail-order pharmacy. Why ask patients to risk their health and privacy? Profit. Not only is this unethical, it's illegal. This forces patients to end personal relationships with expert pharmacists that have been developed over years. It can also mean life and death concerns if medication isn't delivered on time, or there's a bad drug interaction. The law explicitly prevents businesses from discriminating against HIV/AIDS patients, but Blue Cross doesn't seem to care. In addition to disturbing health impacts for HIV/AIDS patients, this action virtually guarantees a loss of privacy. When patients receive packages at work or in an apartment complex, neighbors and co-workers will notice. Our friends at Consumer Watchdog recently helped file a class action lawsuit to force Blue Cross to cover all patients equally. Blue Cross must honor the dignity, privacy, and confidentiality of all patients, immediately. Tell Blue Cross: "Respect both the law and patients' rights and change your discriminatory policy on HIV/AIDS drugs NOW."